Today we want to tell you about an opportunity to hear Wayne Dyer speak live, for free! It’s part of the Hay House World Summit, a chance to experience the teachings of 100 different doctors, healers, and leading voices. For their third annual summit, Hay House collaborated with Caroline Myss, Wayne Dyer, Kris Carr, Donna Gates and so many other inspirational people (96 to be exact) to bring you content that’s inspiring, informative, and empowering. It’s actually coming to an end soon… Soon as in June 5th. Truthfully, we meant to tell you sooner, but this past month has been really busy for us in the office! Thursday, at 7pm EST, you can hear Wayne Dyer share his insights about how he stays divinely guided all year long. The part that’s not free but absolutely, completely worth it is the series of 100 talks, yours either digitally or on CD. It’s called Change Your Life, and by purchasing it, you can have these lessons at your fingertips whenever you want to learn something new or stay on track with your spiritual, emotional, and physical goals. It even comes with meditation exercises you can do everyday! This series of interviews and lessons is nothing short of amazing. No matter where you are in your spiritual journey, you’ll find tons of topics that speak to you. Here are some talks that really caught our eyes and got us curious. Imagine having this tool kit at your disposal. The Change Your Life package even comes with PDF worksheets you can use to really engage with the content and reflect on what it means in your own life. You could even go in on this package with a friend and listen to the lessons together. 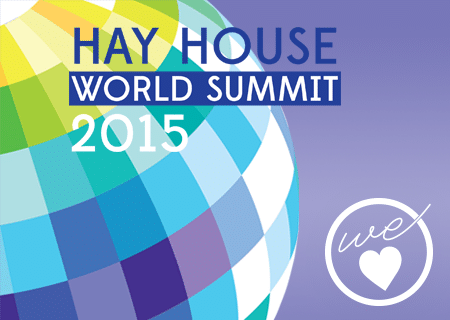 We really believe in what Hay House is doing, and this is just another example of the amazing things they offer. If you’ve attended a Hay House I Can Do It! event and wanted to bring home some of the lessons and inspiration, this would be a really amazing way to do that. If you want the Hay House experience without traveling to an event, this is also the perfect way for you to get that. We really hope some of you take advantage of this amazing offer. The content is incredible and will never be available again in this way. Get it before June 5 and make the rest of 2015 (and your life!) the best it can be. We Heart is our way of telling you about awesome companies, products, events and opportunities. We’re always on the lookout for things that you’d love.